On December 17 2014 president Obama expressed an intention to lift 54 years old embargo on Cuba. 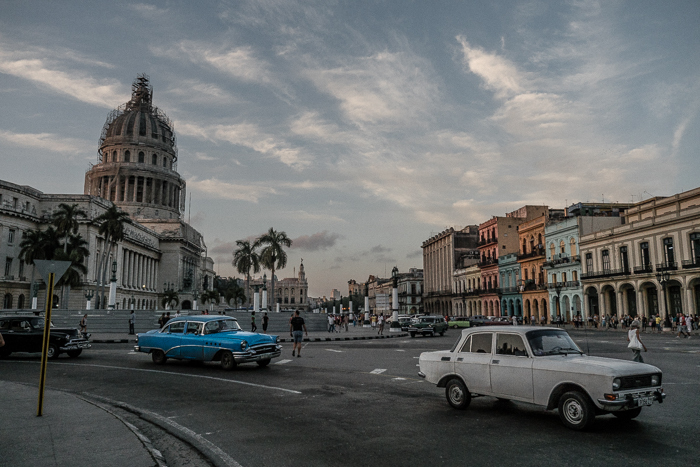 In January 2015 Cuba was still waiting for the changes. 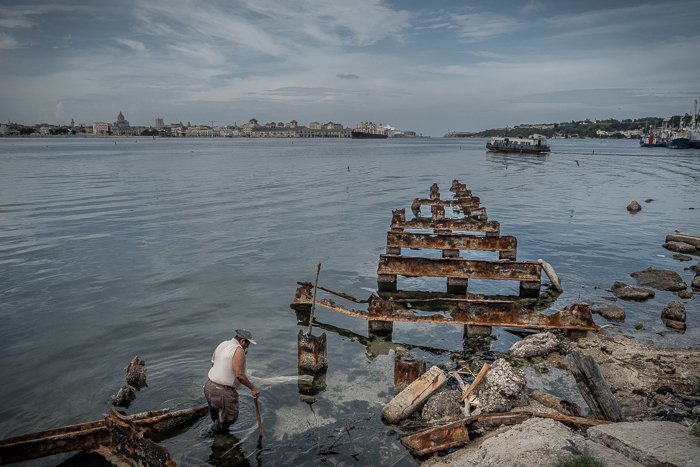 A man wades through water in the Bay of Havana opposite Old Havana, Cuba. 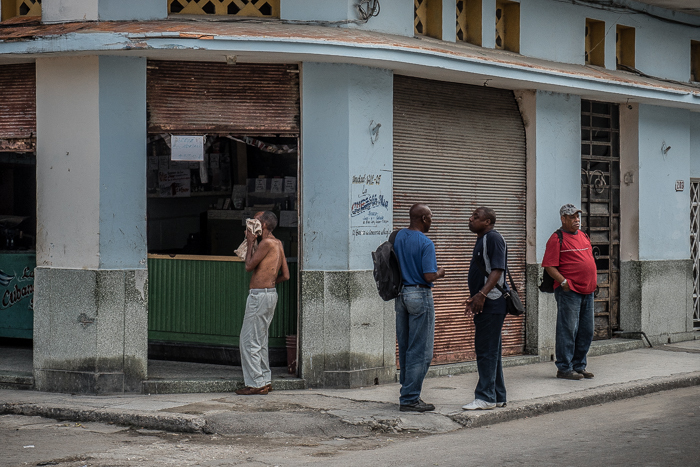 Men at a local free grocery shop in the Regla suburb of Havana, Cuba. Free shops (tiendas libres) are essential for Cubans as the amount of food received by families via free ration distribution system is not enough to survive. 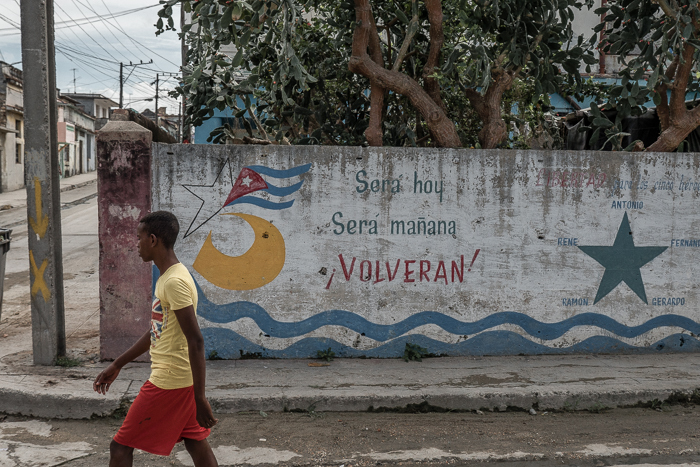 A boy is walking next to a patriotic propaganda graffiti in Regla suburb of Havana. There are no commercial advertisements in Cuba. Any banner in the street conveys some sort of ideological message. 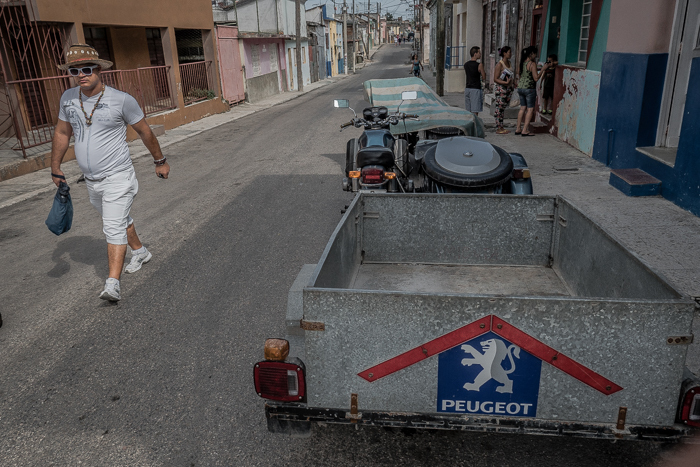 A man is walking next to a hand crafted motorcycle wagon in the suburb of Regla in Havana, Cuba. Years of embargo and cut of aid from Soviet Union made Cubans start refurbishing old vintage vehicles or even create new hand crafted versions. 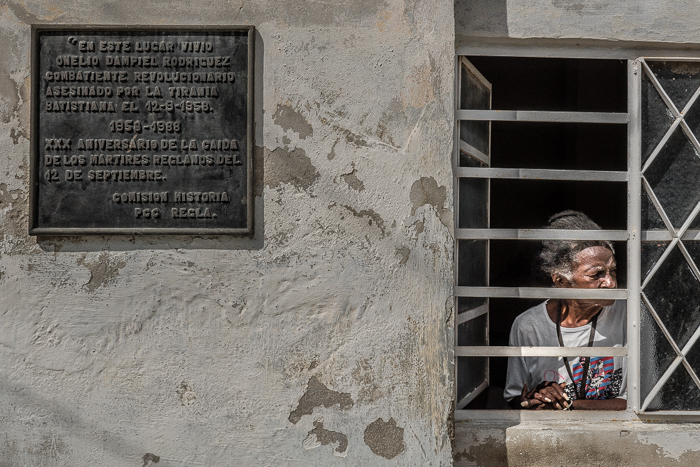 A woman is looking through a window in a house where a revolutionary hero Dampiel Rodriguez used to live in the suburb of Regla in Havana, Cuba. 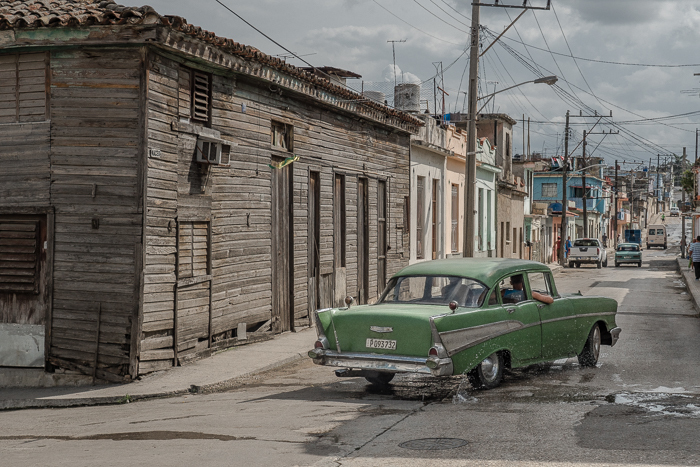 A refurbished 50's American vintage car next to a wooden house in the street of Regla, a suburb of Havana, Cuba. refurbishing of old cars is a necessity in Cuba as car import is virtually nonexistent due to the US embargo of Cuba. 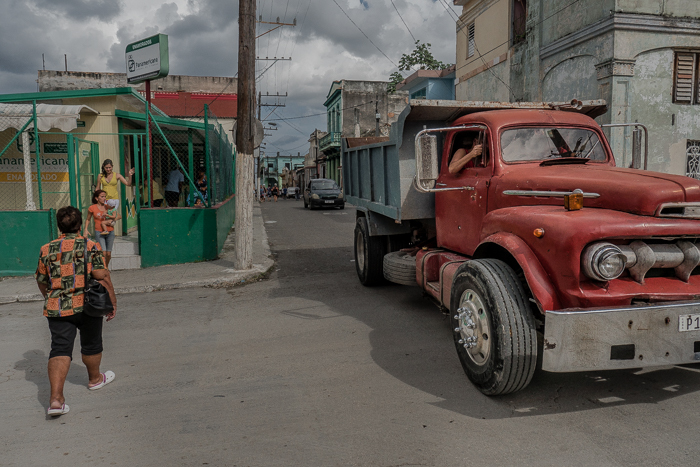 A woman is crossing a road next to a refurbished truck in Havana, Cuba. refurbishing of old cars is a necessity in Cuba as car import is virtually nonexistent due to the US embargo of Cuba. Birds flying over a residential high rise apartment block in Havana, Cuba. 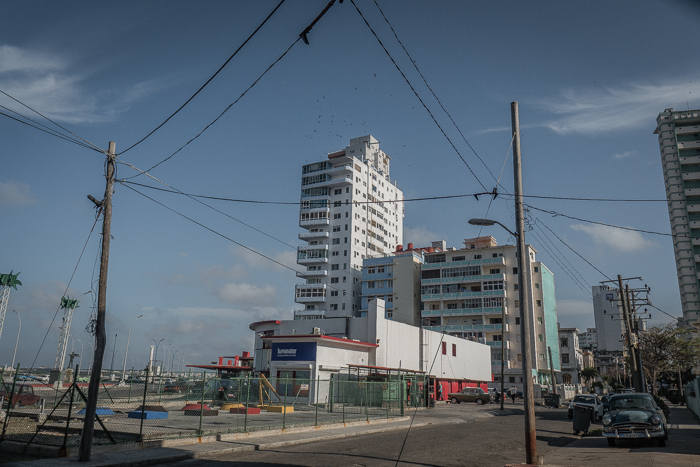 Most of the high rise buildings were constructed in Cuba during the 60-80's when Soviet Union was helping Cuba. 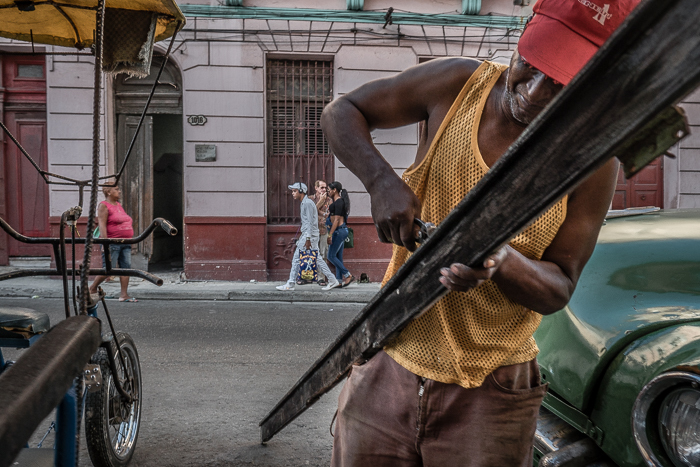 A man is fixing a bicycle taxi in Havana, Cuba. Lack of import of new cars due to the US embargo of Cuba, new means of hand made transport were invented. One of them is a bicitaxi which is a bicycle with seats for passengers which are used as taxis in Cuban cities. 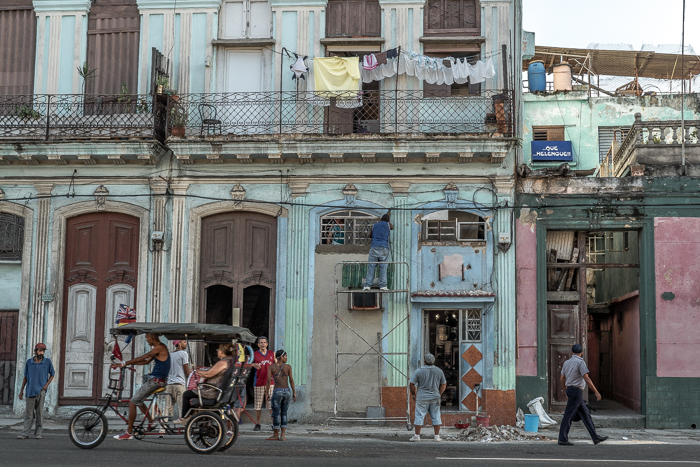 Workers repairing facade of an old colonial building in Havana, Cuba. Due to economical difficulties and international blockade, repair works in Cuba are occasional and chaotic. 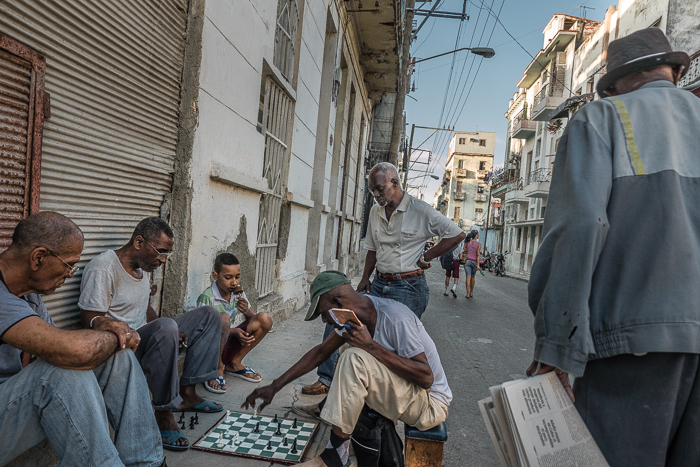 A newspaper seller is walking past men playing chess on a sidewalk in Havana, Cuba. Chess is one of the most favourite games in Cuba and Cubans on average are very good at it. People queueing next to a vegetable market in Havana, Cuba. Due to almost nonexistent food import, agriculture is very well developed in Cuba with most people buying fruits and vegetables from the markets. Agropcuario (agriculture) markets receive deliveries straight from the farm. refurbished 50's cars on a square next to the Capitol building in Havana, Cuba. 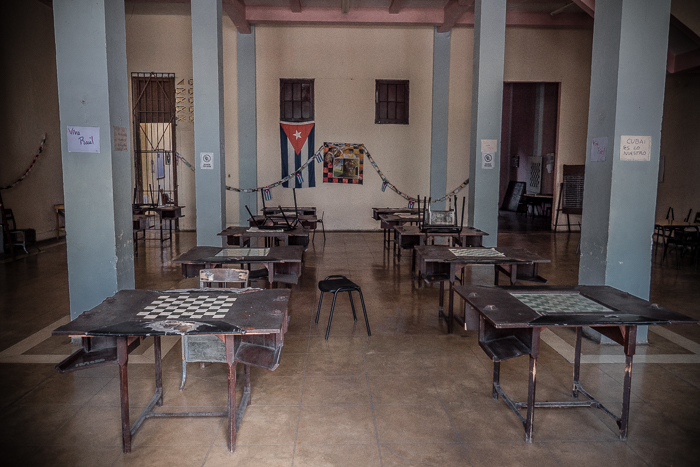 Desks at a chess club in Cienfuegos, Cuba. Chess is one of the most favourite games in Cuba and Cubans on average are very good at it. Revolutionary symbols are an integral part of any public space in Cuba. 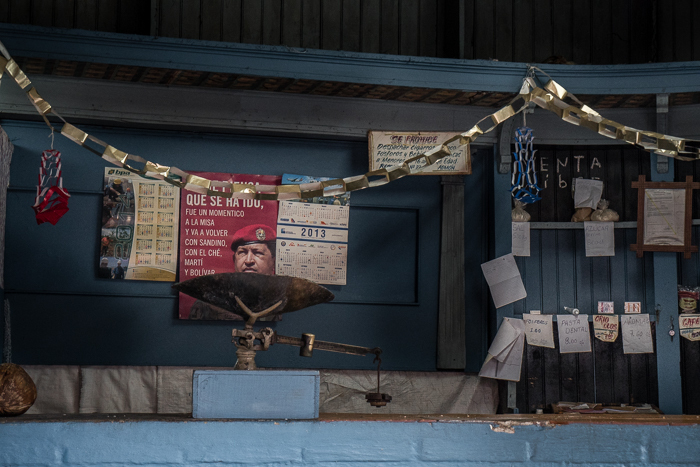 A pig head hanging next to a butcher shop in Cienfuegos,Cuba. 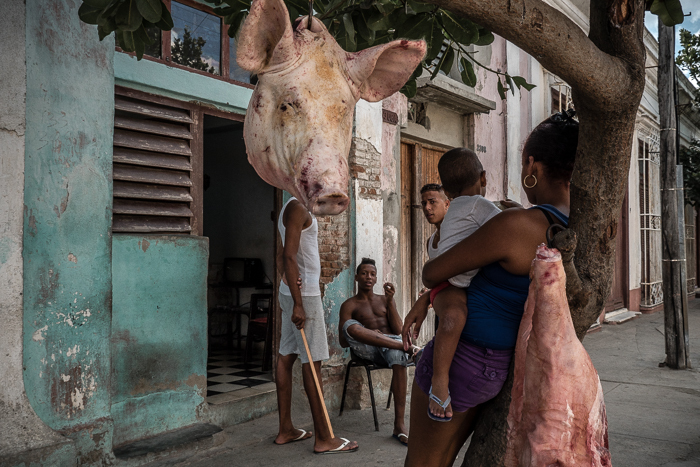 Pork is the main meat in Cuba. Partially because most cows were killed during the hungry years of the "special period" in early 90's. 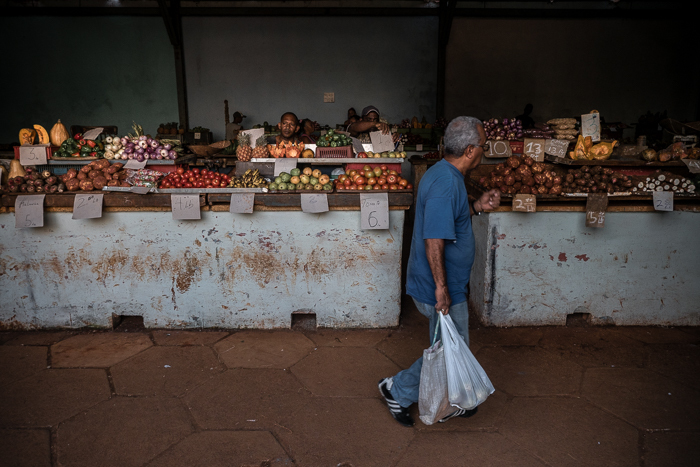 A man is walking in front of stalls in a vegetable market in Havana, Cuba. Due to almost nonexistent food import, agriculture is very well developed in Cuba with most people buying fruits and vegetables from the markets. Agropecuario (agriculture) markets receive deliveries straight from the farm. 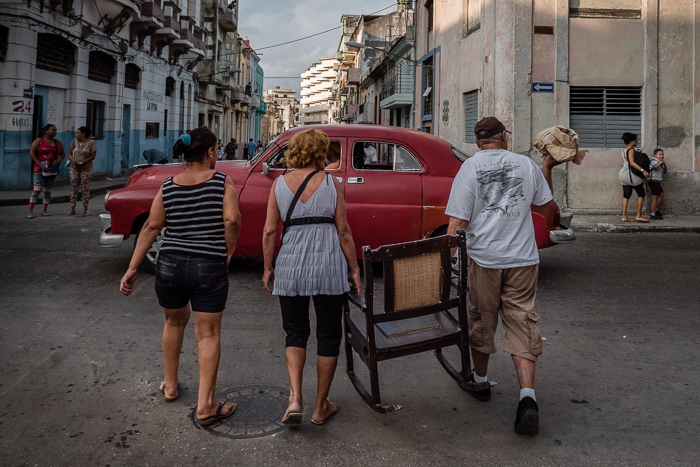 People carrying a chair in a street in Havana, Cuba. Due to economical isolation, recycling is an integral part of life in Cuba. Empty counter in a "free shop" (tienda libre) in Havana, Cuba. 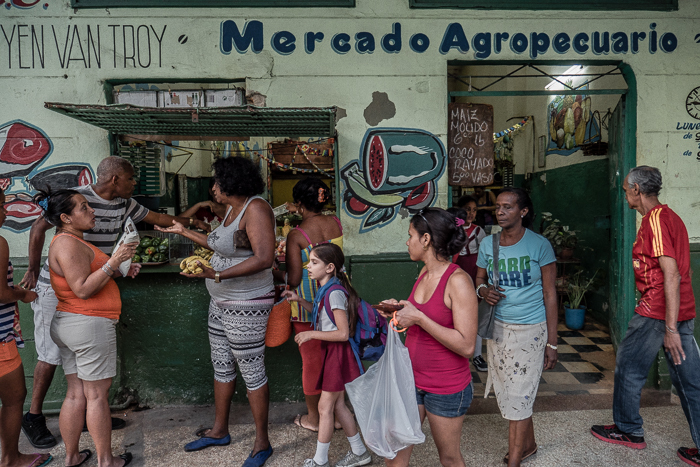 There is no market economy in Cuba which reduces the variety of items in shops dramatically. 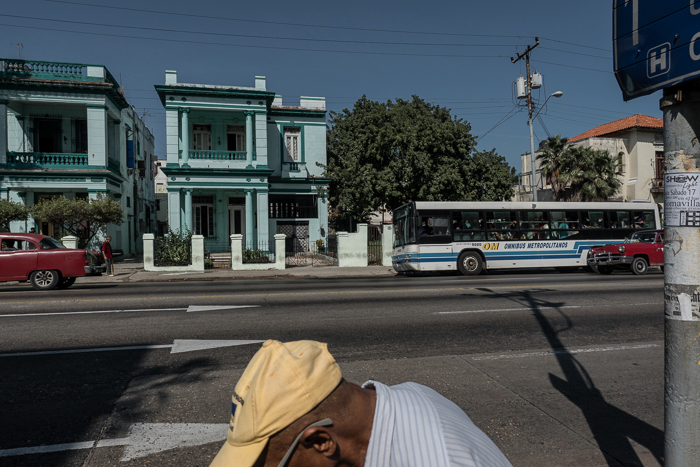 A man is walking past a public transport bus in Havana, Cuba. The famous "camel" trucks in Havana have been replaced with Chinese buses as public transport. 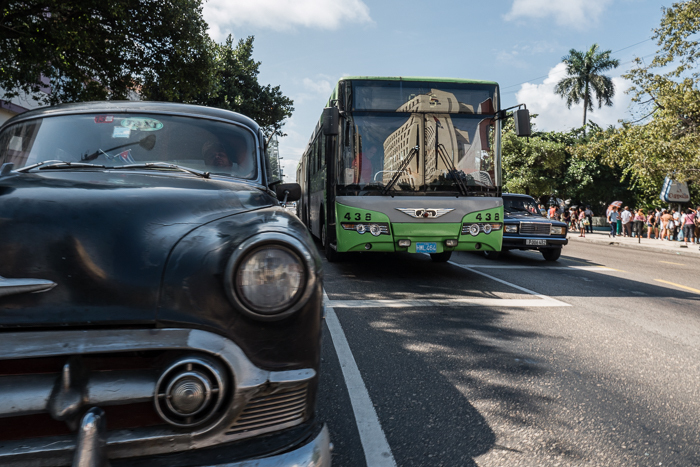 A refurbished vintage American car alongside a public bus in Havana. Most public transport in Havana is operated by Chinese buses. 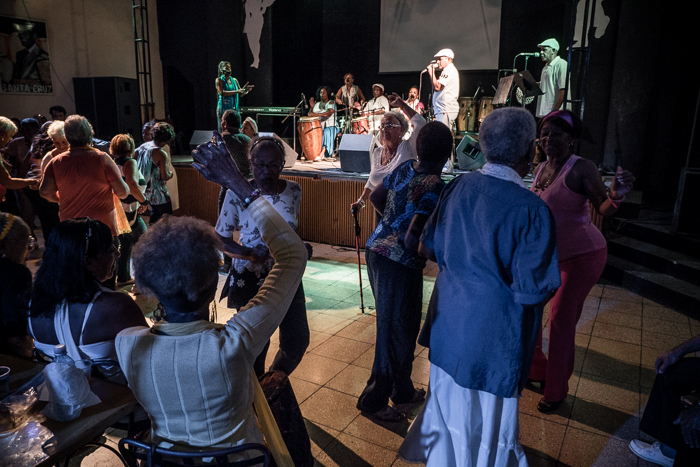 Pensioners dance to rumba at a "peña" event in Palacio de la Rumba (Palace of Rumba), Havana. Music is a very important part of Cuban life.